It has been a tremendous year at OpaVote! We have been constantly adding new features and improving existing features to provide you with the best experience possible for running your elections. 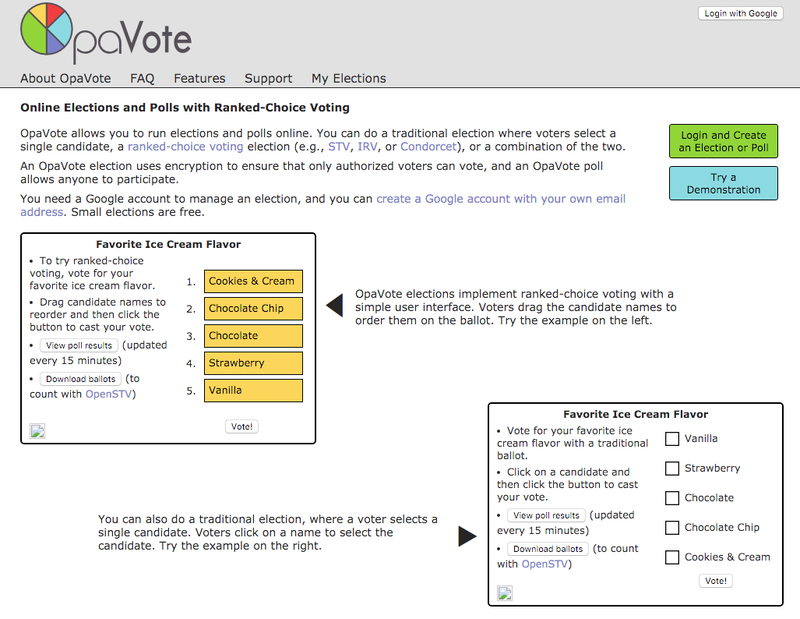 To the right, you can see a screenshot of how OpaVote appeared in December 2014. Shortly afterwards, we hired a graphic artist to design a new logo and we completely revamped the site to make it mobile friendly and better looking. Below are some other highlights of the past year, and we are looking forward to an even better 2016. Redesign of entire website to improve appearance and make it mobile friendly. Added code voters in addition to email voters. 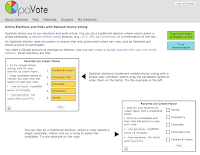 Added option to prevent voter from casting empty or incomplete vote. Added Stripe payments in addition to PayPal payments. Allow managers to make one payment to apply to multiple elections. Automatically email the ballots to the manager at the end of the election. Allow managers to login with Facebook and LinkedIn in addition to Google. Allow managers to publish results after reviewing them at the end of an election. Allow managers to disable voters (e.g., if an email was sent to the voter's old email address). Tell your friends and colleagues about OpaVote. For every organization you refer, we will give you an OpaVote credit equal to their first month's use of OpaVote. Link to OpaVote from your website (e.g., your election page or blog post). This informs your voters so they are not surprised when they receive an OpaVote email and we also appreciate the search engine karma. At OpaVote, we are committed to improving voting rights, and our small contribution to that effort is to help introduce organizations to to better voting methods, such as ranked-choice voting, and to make it easy and affordable for organizations to use better voting methods.